CINCINNATI -- Hamilton Avenue will soon carry only one lane in each direction all day long. In a Wednesday memo to Mayor John Cranley and City Council, acting City Manager Patrick Duhaney detailed an upcoming pilot program to test the traffic impact of 24-hour parking lanes on the major road that cuts through the heart of the neighborhood's business district. Currently, parking is restricted on Hamilton Avenue during the morning and afternoon rush hours, allowing two lanes to carry traffic toward Downtown in the mornings and back out toward the West Side's more residential neighborhoods in the afternoons. The hope, Duhaney said, is to make the street safer for both drivers and pedestrians. "Allowing 24-hour on-street parking would result in one travel lane in each direction for 24 hours a day, which may decrease speeding and increase pedestrian safety in the business district," Duhaney wrote. The city began removing existing parking signage Thursday and replacing it with signs warning of the coming change. Twenty-four-hour parking will begin Saturday, May 12 and continue through June 17. Both the city's Department of Transportation and Engineering and Cincinnati police have identified the stretch as a hotspot for crashes, and the Northside Community Council has been pushing for safety improvements along the corridor for years. Testing all-day parking was one of the changes the NCC requested from the city last year, along with more speed signage, crossing signage, crossings and -- maybe most vocally -- enforcement. As WCPO has reported extensively, a years-long drop in traffic enforcement by Cincinnati police correlated with a spike in crashes. That data analysis also showed that pedestrians and cyclists assume a far higher risk of injury or death following a collision than motorists. READ MORE: Has drop in enforcement made Cincy's streets more dangerous? "They know they won't get stopped. 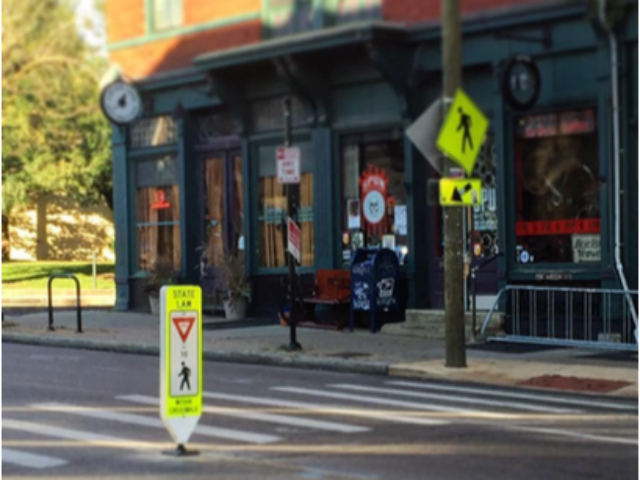 They know they can run a red light," said James Heller-Jackson, chair of the Northside Pedestrian Safety Committee. "Over the years, I believe that traffic along Hamilton Avenue has gotten much faster, and people know they can get away with it." DOTE has installed center-road paddle signage at select crosswalks in the neighborhood and added a new crossing and signage at the intersection of Hamilton and Palm. As far as enforcement, Cincinnati Assistant Police Chief Paul Neudigate updated City Council members Tuesday, acknowledging the drop in enforcement and pointing out crashes declined between 2016 and 2017. Neudigate's report identified the 4800 block of Hamilton Avenue as the second-highest frequency of crashes between 2013 and 2017. Among a number of other collisions involving pedestrians, the death of Northside business owner Sarah Cole in September 2016 galvanized the neighborhood's efforts to upgrade safety measures. Cole died after she was struck crossing Hamilton Avenue not far from her popular burger joint, Tickle Pickle. Current parking restrictions will resume June 18, and DOTE expects to deliver the results of the pilot study in August.